Week two review is here. All I really want to say about this week is, going on vacation and starting a new workout program does not mix well. It was more of a struggle than I want to admit. Here’s why. I decided to bring my step with me which my husband was kind of on board with but it still took up a lot of room. When we got to the hotel I did my usual, laid out my shoes, my laptop, my room key, my mom crack, my water; everything I would need for the next morning’s workout. I always set it in the bathroom so I can get up and ready but not wake the kids. That part was great because I have my discipline and my routine in that area. 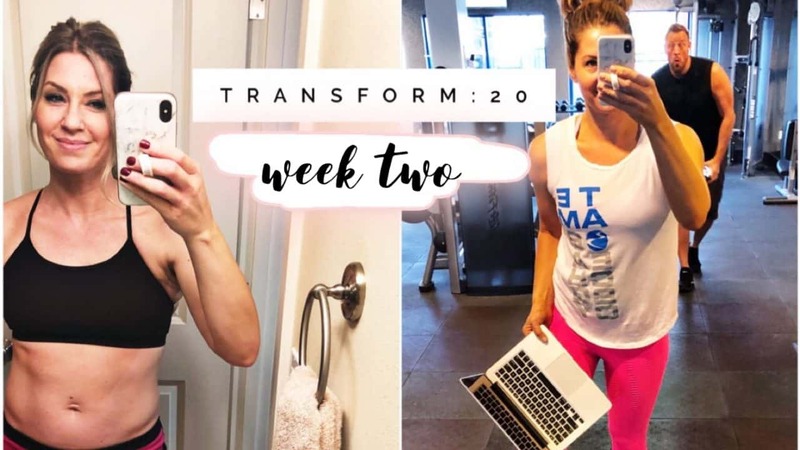 My body just felt really sluggish and heavy most of the week there was maybe two workouts, out of the five that I did there, where I actually felt like I had a little pep in my step. Even though I try hard to read ingredients and stick to lots of vegetables and lean proteins, there is still junk that gets put in the foods. Whenever I travel, I’m so grateful that I have to eat gluten-free because it’s really tempting to eat empty carbs when you are busy and just need to grab something for a quick energy. I think a few days I did not drink enough water and that always makes me feel bloated and almost like I have a weighted bodysuit on, it’s really uncomfortable during these cardio workouts. A couple things I learned about my body on this trip that might help you too is that when you order eggs they tend to use way more oil than they need to. I normally have my shakeology in the room before we head out for the day, but they had a really great egg white frittata that Matt had had the day before and it looked amazing! It had a lot of veggies and it I thought it would be healthy. For the next four hours my stomach felt like it had a heavy weight in it and I was really bloated. I realized it was from the oils that they used on the eggs and I swore that I would always stick to my shakeology in the mornings so that I could start my day off right and not feel gross. I also thought it would be brilliant to buy a spicy pickle that they had at the market but that too had some interesting preservatives, and way too much salt so the next day during my workout I felt really puffy. There are so many things that are just not worth it for my sensitive system. On the bright, I was able to switch my rest day. It’s scheduled to be on a Sunday but I moved mine to Wednesday because I knew I would be home on Sunday to get a good workout in. I also was thankful that the workouts are only 20 minutes because then I could get back to the room and shower and get to Disneyland. Having my “trainer in my in the box” aka the Netflix for fitness right on my laptop, really saves me! I recommend it to everyone but you need to coach too. You need to be in a private accountability group with me, so that you cannot only do your program from anywhere you need to you also get the support of the girls and I so that you have those eyes watching. Making sure you’re showing up for yourself! Overall, staying on track keeps my momentum for my results going strong so that when I come home I don’t have too much to make up for even if my eating was not perfect. You can see in the video that I show some of my salads that I chose and really you just have to seek it out and want to find a healthy food because when you do it’s always there. PS: The caramel apples in Disneyland are definitely worth it.